This course is designed for the NCO or officer serving in the Army National Guard or Army Reserve. Learn how to be more effective, work smart, and maintain balance at the same time. Looking to do a better job managing your time? If you’re currently serving in the USAR or ARNG, chances are you have a lot on your plate. Trying to balance your civilian job, family life and military responsibilities is a tough task. We all know that “Army training” is much more than just one weekend a month, especially when you are an officer or NCO. As a part-time Army leader in the USAR or ARNG, your responsibilities will often feel like a full-time job. To be quite frank with you, it can be overwhelming at times. Sometimes you want to pull your hair out. Sometimes you want to pull someone else's hair out. There are even times when you feel stuck. It's like trying to put ten pounds of stuff into a five pound bag. I hope to fix that. It’s designed to help you achieve balance, work smart, and be more productive. 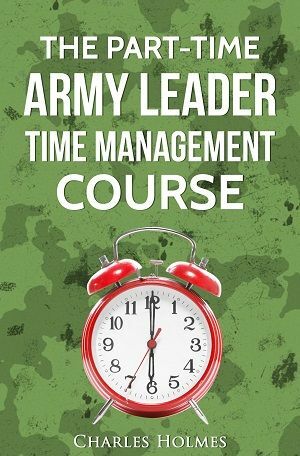 This is a 24-minute audio presentation I created to share some of my best tips about time management for ARNG and USAR leaders. It comes in MP3 format. This is a spreadsheet you can fill out before each drill weekend and know exactly what you need to do hour-by-hour during training. It comes in Microsoft® Excel format and can be modified, printed or used as is. I also provide a sample schedule so you have an idea how to fill it out. This one tool alone is worth the price of this course, as I see it. This is an example daily to do list. It shows you how to rank your priorities, what to delegate, etc. All you need to do is print this off each morning and fill it out before you go to work, or drill weekend. It helps you keep the main thing the main thing. This is a 7-page PDF file with tips from other USAR and ARNG leaders. I interviewed a bunch of officers and NCOs and asked them for their best time management tips. These are the answers I received. This is a list of time management resources that I use and recommend myself. It is a one page PDF file with the best time management tools I could find online.